While I didn't grow up on a farm, I spent many days in my childhood at my grandparent's dairy farm. I have always wanted to have my own farm and raise my children with that kind of life, and in the process teach them some valuable and great life lessons. I know that farm life is hard. There are many set-backs and it is far from being a glamorous job, or one that you can get rich at. Carrying hay to cows as you sink down in knee deep snow, having to carry buckets of water for the animals because the pipes froze, and having your crops eaten by deer, racoons or your own dog are just to name a few. But with what has happened the past several days, I have begun to wonder if it really is worth it. We currently have 7 chickens, 4 ducks, and one guinea. We originally had 4 guineas but 3 of them were killed. 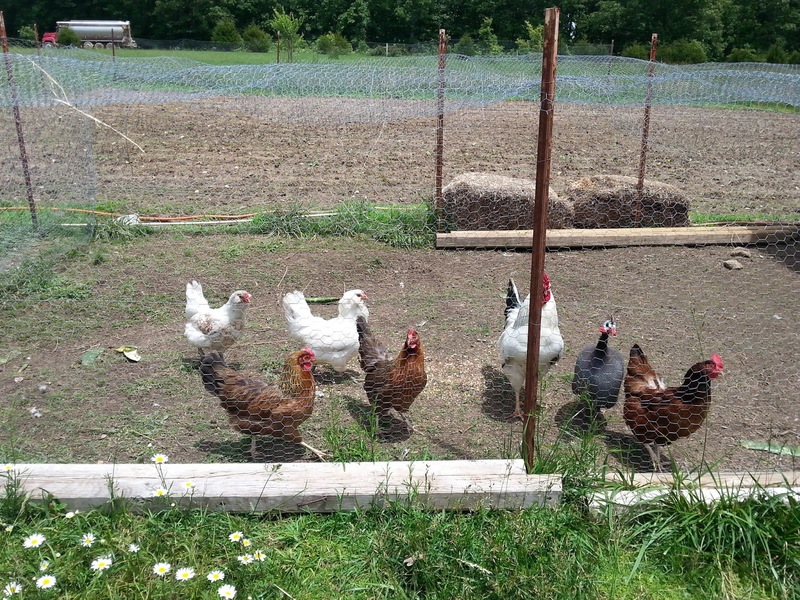 Knowing that they like to be in groups we put the lone survivor in with our chickens. It seemed to work but there are days where they just don't get along. In fact they are just like children. Best friends one day, enemies the next. 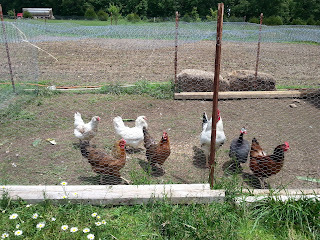 There is definitely a group dynamic being played out daily in our chicken coop. Throw in 4 ducks to the mix and there are times where you have bedlam. My story starts with last Thursday. This was the day where we had one of our roosters (we have 2), and our guinea to get out of the chicken run. And where did they end up? My freshly planted garden! Of course trying to chase them out just ran them further through the garden and all I could think about was that my garden was ruined! To add to that, as Carly and I were trying desperately to get them back, the 4 ducks escaped and you guessed it! They too went right to my garden! It must have been a site to see, me chasing the rooster and guinea, Carly going after the ducks. She had just got the ducks put up, and was back helping me when the ducks got out again. I was ready to cry. It was time to leave for Carly's tumbling class and we were both muddy and out of sorts. Luckily with the help of my husband who had just gotten home from work, we were able to get everyone back in. As if that wasn't enough drama, the very next day after my husband came home from work, he asked if I had seen our calves lately. Come to think of it, I didn't believe that I had seen them in a couple of days! So he started looking for them. And they were no where to be found on our land. That week we had experienced some bad storms, high winds and lots of rain. Steve had found several places where the fence was down. 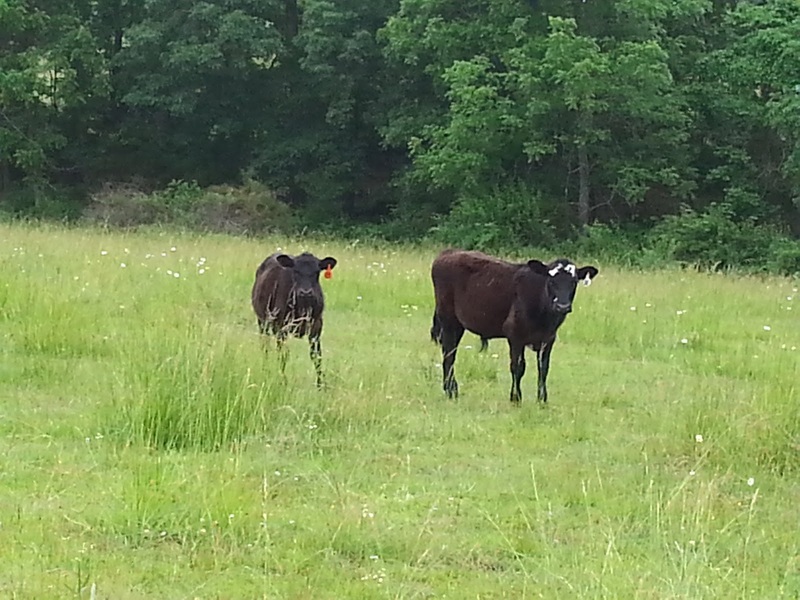 He called our neighbor and asked if he could look on their land, and thank goodness the calves were there and alright! People may not realize it, but cattle thieves still exist and of course that is what I was thinking. So while the calves got home safe and sound, that meant that there was a lot of fence that needed to be mended. A. Lot. Steve spent three days working on all the fence that goes around our entire property and fixing all the spots where the calves could get out. And while he loves doing that kind of work, it was exhausting, hard work. 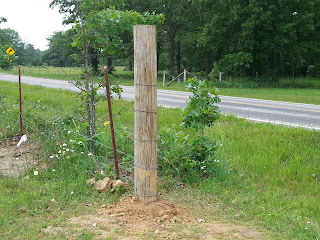 One (out of many) of our new fence posts. Nice work honey! Which brings us to last night. 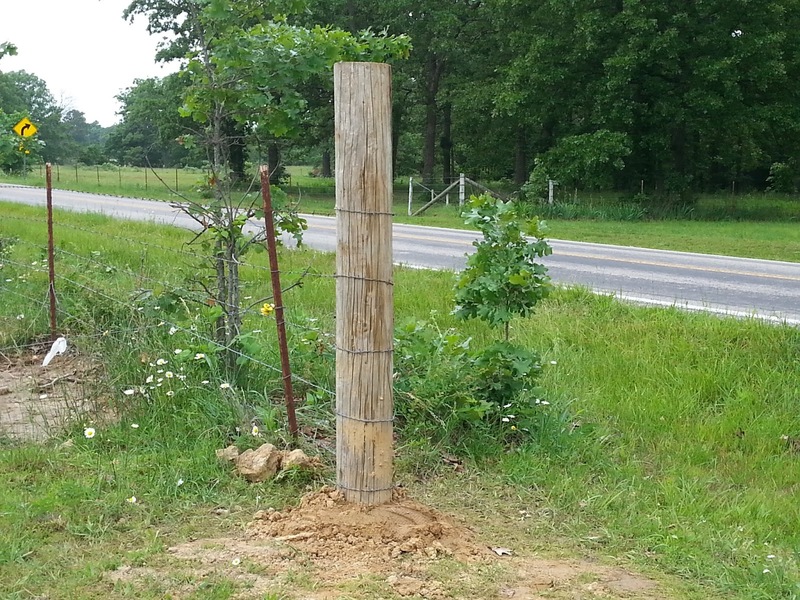 Steve had just finished putting in the last fence post and stretching the wire. He came into the house and asked if our dog Abby had gotten into the pen with the ducks. My heart froze in fear. I asked if the ducks were alright and he said no. Then I asked if they were dead and he said no. I told him that Abby had not gotten into the pen with them. Then he said that two of the ducks had their feathers torn off their backs. 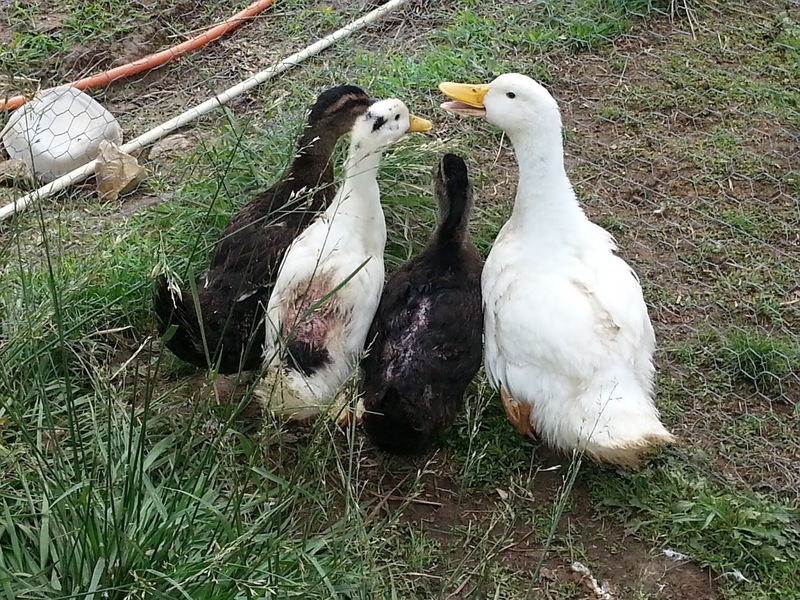 He brought the ducks in and thanks to a friend of mine that also has ducks, I knew that I needed to put some triple antibiotic ointment on their skin to help heal and protect. One duck was worse than the other, and I was just sick to think about the trauma they went through. We think that one of the roosters got to them and was trying to breed them. So instead of a shower and resting, Steve had to reinforce the chicken and duck pens to make sure that they couldn't get to each other. And I had to reassure the kids that the ducks would recover. In fact this morning, the ducks are doing much better. Their little backs look horrible, but they are eating, drinking, and hanging with their buddies. The two in the middle were the ones with feathers gone. Poor babies! So with all this happening within less than a week's time, I have begun to wonder, is it really worth it? It is so much work. Like I said earlier, I knew it was going to be hard work, but it is harder than I ever thought it would be. It has lots of heartache with it too. But there are also the good times. Like the first time we got eggs. The produce that we got from our garden last year and everything we canned for the winter. The freezer full of beef to help feed our family and cut down on grocery bills. The kids learning to bottle feed calves. And more importantly the life lessons that my kids are being taught. They see the good with the bad. They are learning that in life, not everyone wins, and not everyone gets a medal. They are learning that hard work is the key to success, and that being rich does not mean having a bank full of money. So in the end I guess maybe it is all worth it. At least it is giving us adventures that we can have, share, and remember. What about you? What are some of the struggles you have had? Sorry to hear about the struggles on the farm recently. I feel bad for your ducks. I am glad they are going to be ok. I can relate to struggles. When I was working full time and earning my degree I wondered many times if it was worth it. I had to sacrifice lots of family time on the holidays and weekends while others went and had fun. I have to say that looking back on it now the struggles were worth it. Lessons I have learned from my struggles are worth more than any amount of money. The money is ok too! LOL! I know in the long run it is going to be worth it. I think that the struggles that we have is what makes the good times seem so sweet. Thanks for reading and commenting. Working full time AND earning a degree AND having a family is a major struggle. So glad that you were able to succeed!